And so, as a celebration of 20 years in business, Murphy has decided to host an after-hours party under the arbor, to thank friends and neighbors for contributing to the success of the nursery and to enjoy the beauty of the arbor in all its springtime glory in the evening sun. The “Celebrations of the Golden Blossoms” is from 5 to 8 p.m. Saturday, May 18, and will include wine tasting from four local vintners, hors d’ oeuvres provided by Murphy’s daughter and chef Nekoda Acosta and music by Trio Nouveau. Everyone is invited. In 1993, Bayview Farm and Garden was little more than a glimmer in Murphy’s eye. A small greenhouse and 5 parking spaces were the extent of the business. 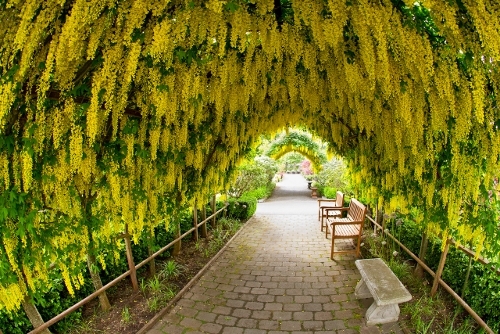 As the nursery grew, so did an obsession for Murphy: She envisioned a living tunnel of Laburnum trees. Commonly called “Golden Chain Tree,” Laburnums bloom mid-May, and have blossoms similar to wisteria vines. She planted saplings, small enough to bend to her will and train onto a metal structure. With careful care and attention from Murphy and her staff through the years her dream of a tunnel of gold has become a reality. Murphy came to the nursery business partly through her family’s business of manufacturing greenhouses and partly through a long journey of discovery of the natural world through travel. She found that the nursery business could be an intersection of her love of the natural world with the world of commerce. 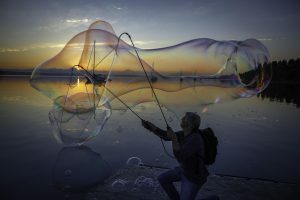 It would also allow her to make a living on the Island while raising her family. She studied horticulture at Edmonds Community College under the tutelage of Dan Hinkley, the now rock-star plants-man. “I really couldn’t be doing what I am doing without Dan Hinkley,” Murphy said. After running a wholesale nursery from her property, she decided that a retail nursery would allow her to grow the business, while bringing her love of plants and the environment to the public. From the start, Bayview Farm and Garden has shunned chemicals. “It was really hard at first. We would get laughed at for not carrying herbicides and pesticides,” Murphy said. But she never wavered from her principles. Standing up to the good ol’ boy network of national nurserymen at conferences, she would ruffle feathers but ultimately make an impression and see changes happen. In 2001, Bayview Farm and Garden was recognized by Garden Center Magazine with Innovator of the Year honors for their pioneering use of only organics. “It is believed that Bayview Farm & Garden was the first garden center in the nation to go “green” from the start, helping to create the movement toward non-toxic garden,” Murphy said. From that point on, she was invited to sit on panels and make presentations and became a nursery rock-star in her own right. Beyond using her business to educate the public about plants and right use, Murphy said there’s also the aesthetic aspect that’s important. Everyone is welcome to raise a toast to beauty with Murphy and the staff at Bayview Farm and Garden under the breathtaking Laburnum arbor this Saturday. Wine tastings will be provided by Spoiled Dog Winery, Blooms Winery, Comforts of Whidbey, and Holmes Harbor Cellars. Music will be provided by Trio Nouveau. Penny Webb is a writer, musician, landscape designer and mom. She is currently working on her memoir, planting a new rockery, and bribing her kids to do their homework.